Om Shri SadCthitAnand SadGuru SaiNath Maharaj Ki Jai! Was just reading Sai SatCharitra. Sai Satcharitra seems to have a great deal of importance in my life. The grace that flows through Shri Sai SatCharitra is immense. Sai Baba's grace is present too much with this sacred pothi. One of the reasons for the immense popularity of Sai SatCharitra parayan with so many Sai Baba devotees, whether they are aware of it or not. My first experience with this sacred book Shri Sai SatCharitra has already been written in my first experiences with Shridi Sai Baba. That was an experience with which Sai Baba made his grace felt through this sacred book for the first time to me. Since then Sai SatCharitra has been a constant companion with me. I have been holding and carrying the book with me since so many years. Talking mentally with the book. Even sleeping with the book. The book lies near my pillow and i sleep with my hand on it. Going to sleep while feeling Sai Baba's grace is really a fortunate experience. More the parayans are done, stronger the bond becomes. The force of grace gets stronger and stronger on this spiritual weakling. Since last Navratris to this Navratri, had completed two sets of 20 parayans each. The first 20 Sai SatCharitra were driven by fear. This is one of the chief specialty of our Sadguru Sai Baba. If you cannot love God enough, if you cannot spend enough time in love with God. Come to Me and ask for some security, ask for freedom from agony, ask for material or emotional comfort. I will give you that, so that I can give what is best for you. The love for God. As i mentioned earlier, i used to carry Sai SatCharitra most of the time. Even while at work. It felt i was holding hand of Baba all the time. One thing i asked from the grace of the book always was freedom from work for monetary gains or survival. This was done at the times of satisfactory monetary gains or loses. I want to spend most of the time time feeling your grace in silence was the call of heart and mind. This prayer was listened to and granted. Since three to four years i can spend most of the time with Baba's grace, either meditating, worship, Sai SatCharitra parayan, aarti. Thank you Baba for the same. Now may be i was not giving enough time to the parayan of Sai SatCharitra. So the necessary money that was flowing in every month reduced much. The reduction of the money meant to give the mind on any other work for the quest of survival. This brought about great disturbance. On doing some research on the work that gave me enough money, i found that there was no way it can be brought back. Immediately the mind went where it goes at the times of troubles, Sai Baba. It said, Baba looks like i am doomed. Will be forced for the quest of survival. Will have to leave the maximum time devotion to You, the surrender to Your grace. Baba if the money income gets as before i'll do 20 Sai SatCharitra parayans. The mind and heart was still at awe. Next morning my hands clicked on computer screen to see if the impossible has been done. What have You in store for me Baba. Continue with this luxurious Bhakti or run around in the market place. i could not believe what my eyes saw. Everything had been restored as before. Well, not as it was before, in fact in far better position. So Sai Baba You did your job, now the ball was in my court. I had to do what i promised. That's how first 20 parayans were done. And with each parayan You made your presence felt all the time. I bow 1001 times to Your love. Was reading a very good book Sai Baba the Master by Acharya E. Bharadwaja. Readers can read online this good book on Sai Baba here. In the book was reading experiences of Kusha bhav . Sai Baba one one occasion advised him to complete 108 Guru Charitra parayans, each parayan to be completed in 3 days. This particular advice was a great attraction to me. So after praying for successful completion of 108 parayans of Sai SatCharita (each one in three days) have started it on 15th September 2009. So far three prarayans have been completed and the 4th one is on. With each parayan the force of Sai Baba's grace is getting stronger. Was just thinking about the gold of Sai Baba. Sai Baba many a times refered to God's grace as moeny or gold. It was a symbol He used for God's grace and Fakir was symbol use for God. Quiet a miss match if we see it completely in material sense. A true Fakir does not even accumulate little material money with him, gold is to far a thing he would keep. So was thinking of the gold that flows through Sai SatCharitra and reached at the end of Chapter 32 where Sai Baba said about His gold. Normally i do Sai SatCharitra parayans of the abridged version available at Sai Baba Sansthan Shirdi, which we also distribute for free. But while writing on this blog i also use verse by verse translation in English of original Marathi Sai SatCharitra. The English translation done by Indira Kher. On opening the book randomly what i read is "My Master says, Take, O take away!". Exactly what my heart felt like writing on this blog. A small miracle in itself. 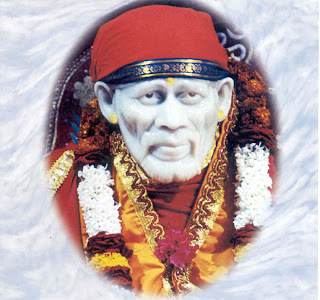 Or Baba's presence with this post and the blog, as it is with Sai SatCharitra. 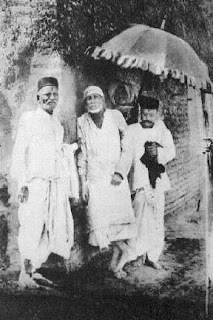 Before what Sai Baba said about the the gold (God or Guru's grace) there is a mysterious symbolic story which Sai Baba said. Once when I was small, stinting on my own needs, I set out in search of job for my livelihood. As i walked along I came to Beedgaon, where i rested for a while. But my Fakir had a different plan for me, which brought me great happiness. There i secured a job of doing Jariwork. I worked untiringly and my work came to fruition. Such is the power of the Fakir! There where four other boys, employed before me and much acclaimed for the their skills. They too were working there, and there work was assessed on completion. One had put in work worth Rs. 50/- ; another worth Rs. 100/- and the third one, worth Rs. 150/-. But my work was worth double their amount. Seeing my skill, my employer was very pleased, and being fond of me, praised me highly. He presented me with a dress, consisting of a turban over the head and a 'shela', to take over the body. But the moment it was given, I just tied it in a bundle and put it away. How can that suffice which somebody gives you? However much it is, it is inadequate. But when God gives something, it has no end, even to end of time. "What my master gives me is real 'giving'. How can someone else's compare with it, ever? How can the 'limited' lend distinction to the 'boundless'? "My Master says, 'Take O take this away!' Everyone says, 'Give give only to me!' But no one heeds my words. No one listens to me attentively! "His treasury is overflowing but no one cares to bring the carts. Nobody will dig, when asked to do so. No one bothers to make the effort. "And what, after all, is our fate? Dust will return to the dust, and the wind, to the wind. And this opportunity, once lost, will never come back again! "However, the skill of my Fakir, the leela of my bhagavan, the harmonious consistency of my Master is something quite different, quite unique! The above symbolic and story told by Sai Baba, like many other pointed to the real wealth, God's grace. But one has to listen attentively to what Baba says and work for the real gold. Fill one's cart with the real gold which is not limited. What God's grace gives none can give. How can the gifts from someone limited can be compared to limitless. We are always in serach for the gifts from fellow human beings, looking for love, emotions, things. Even if we get it, it is always inadequate.It can not be compared with the love of God, the grace of God, which has no end. Sai Baba ke Charano me pranam. 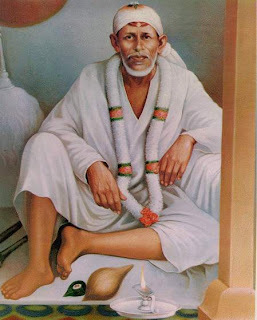 Saibaba's story about Jari work refers to Life of Kabir. There are instances where Baba has called Kabir his Guru and few times he said He was Kabir! Bhagwan Rajneesh says "Kabir is the future of mankind because he showed the world how to live without being Worldly". Kabir loved his work yet he was Spiritually Perfect!